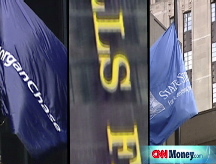 Banking giant books its fourth straight quarterly loss but the loss was smaller than expected. Including Thursday's numbers, Citigroup has racked up more than $20 billion in losses as a result of the credit crisis. How gloomy are you about the nation's economy? NEW YORK (CNNMoney.com) -- Citigroup's losing streak continued after reporting a $2.8 billion loss Thursday, as the bank found itself stung yet again by credit and mortgage-related writedowns. During the third quarter, the company said it lost $2.8 billion, or 60 cents a share. A year ago, the company reported a profit of $2.21 billion, or 44 cents a share. This marked the fourth-consecutive loss for Citigroup, the nation's largest bank by assets. The company has lost more than $20 billion in the past four quarters. The latest results, however, were somewhat encouraging as the loss was smaller-than-expected. Analysts were expecting a loss of 70 cents a share, according to Thomson Reuters. Still, that did little to comfort investors as Citigroup (C, Fortune 500) shares tumbled 2% Thursday, extending Wednesday's painful 13% decline. "[The numbers] still show that the company is mismanaged," said William Smith, president of SAM Advisors LLC, whose firm owns shares of Citigroup. "Part of this is the macro-environment as all the banks are having writeoffs. But Citi is above and beyond." Citigroup CEO Vikram Pandit attributed the company's latest performance to more than $13.2 billion in writedowns the company took during the quarter, including a $4.4 billion charge in its securities and banking division. But Pandit gave an optimistic assessment of the company's ongoing restructuring plan. During the third quarter, the company sold assets while trimming its payroll by 11,000 workers as part of a previously announced layoff program. "We expect these improvements will enable us to realize the full earnings power of our franchise as the economy stabilizes," Vikram Pandit, Citigroup CEO said in a statement. While writedowns continued to eat away at the company's latest results, Citigroup also found itself hit hard by credit costs during the quarter. Both its consumer banking and massive credit card business swung to a loss during the quarter, as the souring state of the domestic economy and housing market forced Citi to bulk up its credit loss reserves. But credit problems were not limited to the United States. Citigroup, which has a footprint in some 100 countries around the globe, reported rising credit losses in a handful of markets including Mexico, Brazil and India. Citigroup chief financial officer Gary Crittenden warned investors during a conference call Thursday morning that losses related to consumer credit could continue growing well into 2009. Citigroup's report is yet another dose of bad news for both the New York City-based bank and the overall financial sector. Merrill Lynch (MER, Fortune 500), the investment bank that agreed last month to sell itself to Bank of America, announced a bigger-than-expected loss Thursday morning. Fearing further fallout in the banking sector both domestically and abroad, government officials around the world enacted measures in recent days to help prop up the industry. As part of that plan, top U.S. regulators unveiled plans to inject $250 billion into the nation's banking system, with half of that amount going to nine major financial institutions including Citigroup, as well as rivals JPMorgan Chase (JPM, Fortune 500) and Bank of America (BAC, Fortune 500). Crittenden backed the plan, saying it would only further strengthen Citigroup's capital position. He said that the firm would not treat it like a "windfall" but pointed out that some of the money could be used for acquisitions. "It does present the possibility of taking advantage of opportunities that were closed to us," he said. Citigroup has showed a lot of interest lately in bulking up its retail branch network. Last week, Citigroup pulled out of its plans to buy the banking assets of Wachovia (WB, Fortune 500) after it could not reach an agreement with Wells Fargo on how to split Wachovia's assets. Although Cit's proposed deal was brokered by the FDIC and prevented Wachovia from failing, Wells Fargo (WFC, Fortune 500) subsequently made an offer to buy all of Wachovia. That deal was approved by the Federal Reserve over the weekend. Since then speculation has turned to what Citigroup might try and buy next. Crittenden said that the bank also considered offers for two other banks recently. One is widely believed to be failed savings and loan Washington Mutual, which was ultimately acquired by JPMorgan Chase.